In Collaboration with Crescent OC mentorship UCI’s Ultrasound Interest Group taught ultrasound and organized a student panel to share our members medical school journey with high school students in an effort to expose and inspire the next generation to ultrasound and a career in medicine. Register now for UC Irvine’s fifth annual UltraFest! 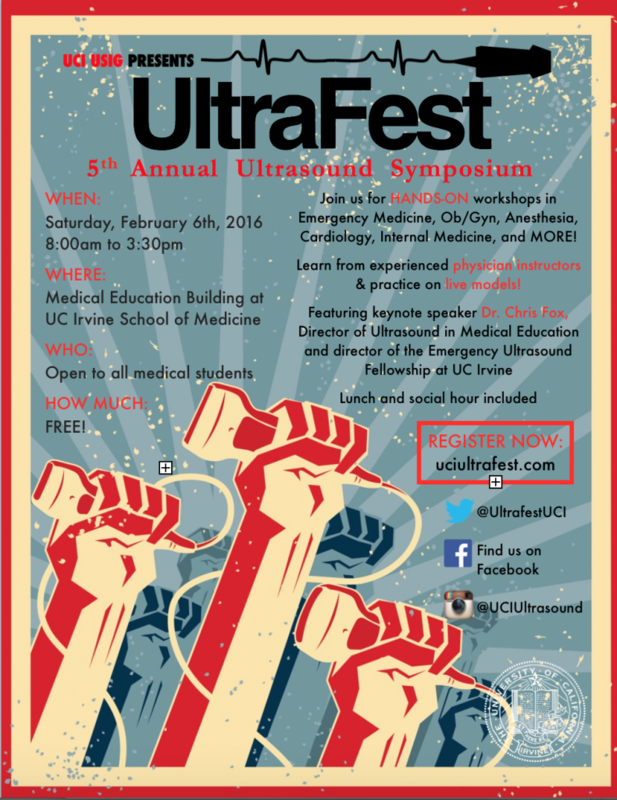 UltraFest: February 6, 2016 at UCI! For full details regarding this years UltraFest head to http://uciultrafest.com/ or register now by clicking the flyer below! 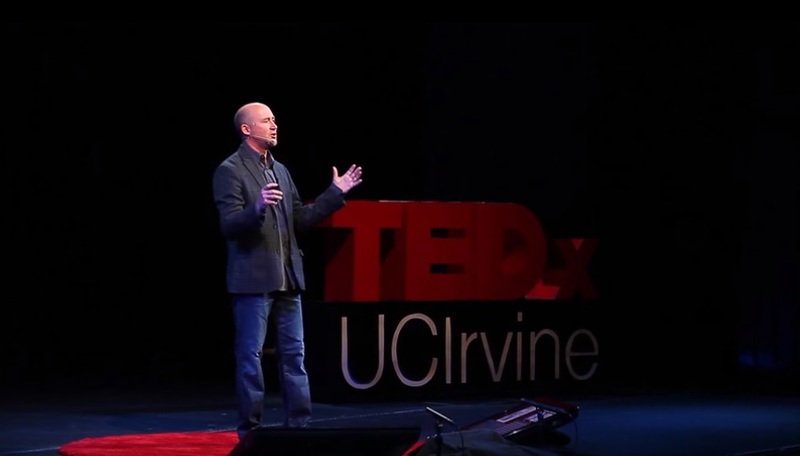 Dr. Fox’s talk given at TedXUCIrvine on May 8, 2015 on the future of point of care ultrasound! Dr. Fox gives an overview to the future of point of care with the use of ultrasound. 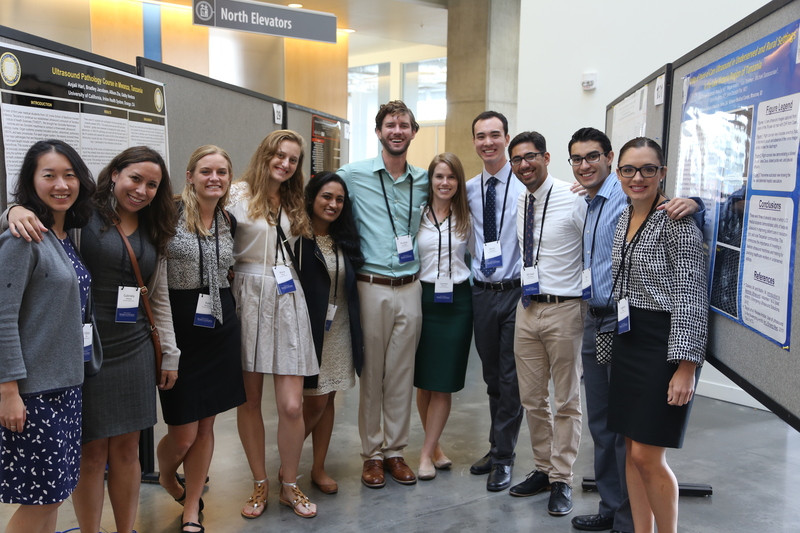 Several UCI students attended and presented research at the World Congress on Ultrasound in Medical Education on October 10-12, 2014 in Portland, Oregon. Students presented over a dozen studies from international ultrasound projects, and well as several other ultrasound education studies. 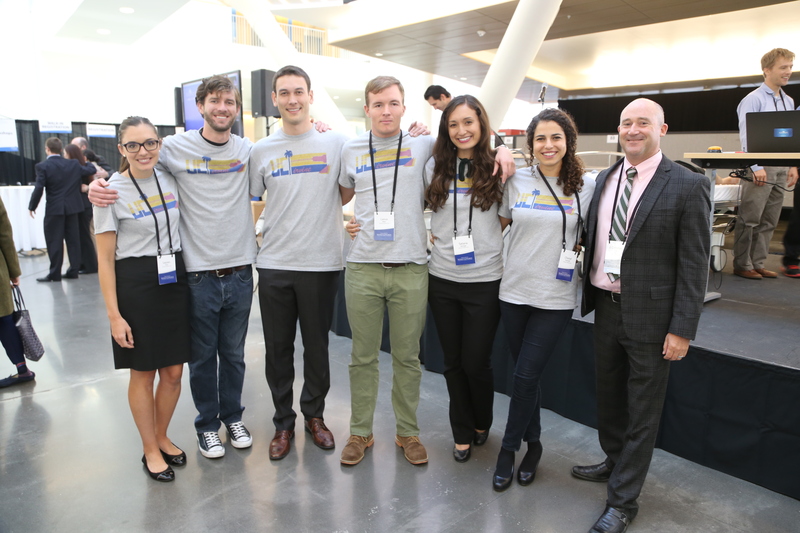 We had a fantastic time at the conference hearing innovative and inspiring talks from faculty , attending hands-on workshops, as well as meeting leaders in the field and fellow medical student ultrasound enthusiasts. Some of our UCI USIG members enjoyed the opportunity to participate in the First Ultrasound World Cup, forming the UCI Sonobabes and Bronography teams. A special thanks the organizers at OHSU for an incredible experience! Please RSVP so we can get a head count for lunch! The USIG board has been hard at work this past month and we have some great updates for you! -Keep your eye out for an upcoming elective proposal for the MS3 and MS4 classes to complement the MS1 and MS2 electives. The elective will feature the chance for third and fourth years to teach ultrasound to the first and second years for two weeks. -Planning is underway for the second annual Ultrafest next spring which will be even bigger than last year and feature more collaboration with West coast medical schools. 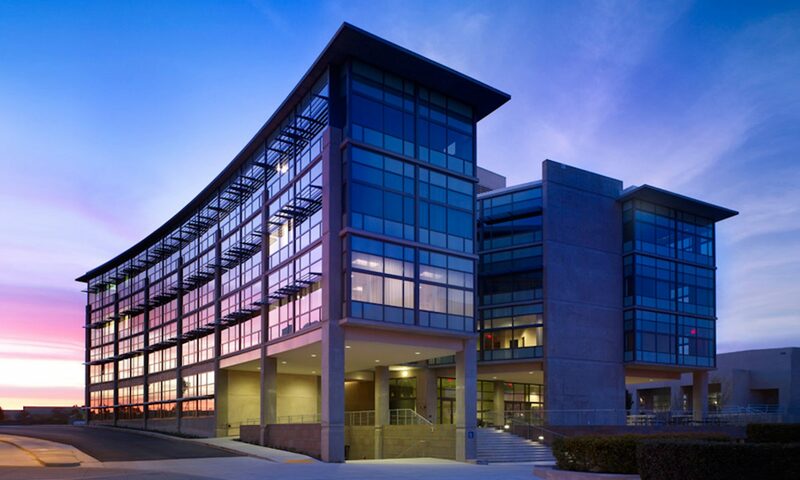 -Development of a patient pathology database will become a great resource for medical students at UCI to quickly identify and learn about the different presentations of patholgy and images taht can be acquired with ultrasound. Information will be kept secured on a UCI server with full patient consent. 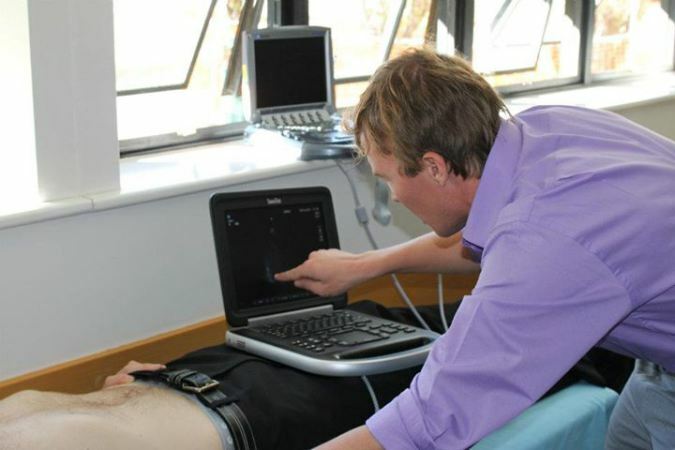 -Interested in doing ultrasound research abroad? UCI medical students can find opportunities with USIG to travel internationally to Panama to help run clinics, respond to emergencies, and train others in ultrasound use. -Community outreach is a large part of USIG and there is a large project currently underway that NEEDS volunteers to help screen for heart disease with ultrasound as part of a research project in local high schools. Keep checking this website for details and updates for USIG! 1. Health fair in Santa Ana in Madison Park. Medical students were on hand to provide information on heatlh education and spur children’s interest in medicine using portable ultrasound machines. 2. 2012 Western Regional Emergency Medicine Student Symposium hosted by UC Irvine School of Medicine in collaboration with the Keck School of Medicine of USC. Members of USIG were present along with Dr. Fox to teach bedside ultrasound to conference attendees. – The Narrated Lecture Series contains various lectures highlighting many important applications of emergency ultrasound. – The AEM Virtual Issue is an open‐access list of all Academic Emergency Medicine EUS articles currently published and organized by topic. If you are not already a member, please consider joining AEUS and becoming part of an expanding community of sonographers, educators and researchers. Please pass this on to your current, past and future fellows, residents and faculty to encourage membership. Don’t miss out on all that AEUS has to offer and join today! – AEUS membership for medical students is free!! 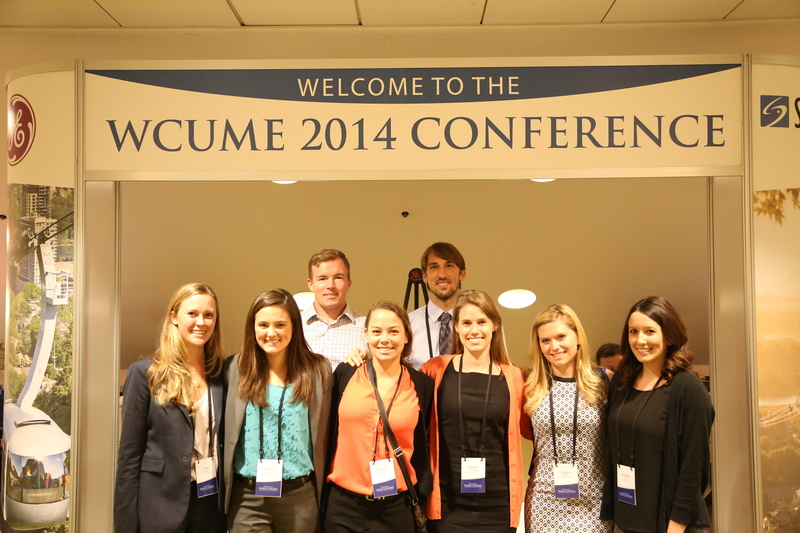 – AEUS membership for residents and fellows is a nominal $25 and $100 for attending physicians. Please visit http://www.saem.org/academyemergencyultrasound for further information and membership application.